These questions are general in nature. You should get professional advice about your individual situation. Contact us if you would like specific advice on a matter. No - you can prepare your own financial statements and tax returns. However many business owners like to seek the advice of a Chartered Accountant to ensure that they are doing things right and maximising their profits. Whats the difference between an accountant, a Chartered Accountant and a tax agent? and experience suits your needs. A Chartered Accountant (CA) is a member of Chartered Accountants Australia + New Zealand. To become a member you need to have a University qualification in accounting and three years practical experience working under the supervision of a CA. CA's are required to undergo minimum levels of continuing education each year and may work in industry, government or in public practice. public and are subject to regular reviews by the institute. do not need to be (but can be) Chartered Accountants. Chartered Accountants Australia + New Zealand website. 1. What is the best structure for my business and my personal situation (sole trader, partnership, company, trust etc.)? 2. What taxes do I have to pay and when? 3. How can I maximise my profits and minimise my taxes? tax returns) and for one on one Xero training. We charge $250 +GST per hour for advisory work. We also offer packages covering a number of services that can be paid for monthly. To view more information have a look at the packages page on our website here. It is simplest and easiest is to operate in your own name as a sole trader. However there are tax benefits from operating as a company and a company and can appear more commercially professional. A company structure also provides opportunities to sell your business by selling the shares in the company and to expand or obtain further investment in the company by selling shares to new investors. Trading trusts are sometimes used but IRD has been known to look carefully at these. You can set up a company online for about $132 at the Companies Office website. All you need is an email account, a credit card and access to a printer and scanner. There are step by step instructions on the Companies Office website (see below) and if you do it during normal working hours it should only take them a few hours to process. You need to decide first on the name for the company and who will be the directors and shareholders (you can have a sole shareholder and director). The Companies Office will email you with forms for all directors and shareholders to sign agreeing to be shareholders and directors of the company and these need to be scanned and uploaded back to the Companies Office website. You can also obtain an IRD number and register for GST while setting up the company. Companies Office website at www.companies.govt.nz. You need to have a special resolution of the shareholders agreeing to close down the company usually because it has ceased to trade and you need to organise to distribute the assets of the company. You have to advise the Registrar of Companies that there are no outstanding creditors and provide written confirmation from IRD that all taxes have been paid. Annual returns need to be up to date. It will cost around $2,000 to set up a simple Trust and transfer your home to the trust but you should shop around and make sure that you are aware of the actual cost before the Trust is set up. For example if you use a solicitor to prepare Deeds of Forgiveness of Debt there will be a charge for this and if you have a solicitor as a professional trustee they may charge for annual trustee fees. If the Trust is engaged in a taxable activity then an income tax return may also need to be filed with IRD. Are Trust gifting costs tax deductible? No, because they are not directly related to earning taxable income. What tax do I pay on a redundancy payment? If you are on PAYE your payroll section will be the best people to tell you exactly what tax will be taken out. There is more information on IRD's website here. What costs can I claim against a rental property? You can claim any cost necessarily incurred in deriving taxable income. This means that if the cost was directly related to earning the income then it is deductible. The usual expenses that are tax deductible are interest on the mortgage (but not principal repayments), rates, insurance, property management fees, body corporate fees, repair and maintenance costs, any minor equipment costs less than $500. There may also be some travel costs. If you are managing the property yourself and particularly if you have several properties you can claim home office costs. Usually entertainment expenses (meals and drinks consumed off the office premises) are 50% deductible. If you bring food or drinks into your office (e.g. because people are working late) then it is usually fully deductible. If you are travelling for work any of your accommodation and associated costs (meals etc.) are fully deductible. However if while travelling you are paying for meals for work related guests then the cost of the meal is only 50% deductible. Definitive answers on what you can and can't claim are contained in IRD's IR268 booklet on entertainment here. Can I offset rental losses against other income? You can do this either at year end when your tax return is filed or during the year. If waiting till year end then you will need to file a tax return and show the loss there. This loss will reduce your taxable income and you will be refunded any overpaid PAYE. This means that you will receive an annual lump sum refund. If you would prefer to receive the refund as part of your fortnightly pay then you can complete an IR23BS available on IRD’s website www.ird.govt.nz. This form requires you to estimate the amount of loss for the next year. IRD will then calculate the effect on your PAYE and provide you with a special tax rate certificate. You should give this to your employer who will then deduct a lesser amount of PAYE. You will still need to complete a tax return at year end and if the actual loss was the same as the estimated amount you will not receive any further refund. If the actual loss was more than the estimate then you may receive a refund. If the actual loss was less than the estimate then you may have tax to pay. Remember to get the special tax rate adjusted back if you sell the property during the year. Otherwise you may have a large tax bill at year end. However, from 1 April 2019 rental losses will generally be ring-fenced and instead of being offset against your income, will be carried forward to offset against future taxable income from the property, including any tax payable if you sell the property under the brightline test (ie if you buy and sell a property within 5 years). If you have more than one rental property, losses from one property can be used to offset income from other rental properties. Provisional tax is a method of paying tax as you go during the year but without the formalised PAYE system. If you are earning income as a sole trader or as a shareholder employee then you are not required to deduct PAYE from your earnings. Instead you can pay provisional tax during the year with a “wash-up” at year end. The amount of provisional tax you need to pay is the same as the tax you paid on last year’s actual earnings plus 5% if your tax for the year is $60,000 or less. If your tax for the year is likely to be more than $60,000 then you can pay based on last year’s actual earnings plus 5% for the first two provisional tax payments, but are required to pay enough on the third provisional tax due date to cover your full year’s tax liability to avoid being charged interest on any shortfall. If you paid more tax than was required then IRD will pay you interest as well as refund you any overpayment. What are the 2018/2019 provisional tax dates? ‍If you are GST registered (6 monthly) you make two provisional tax payments - 28th October 2018 and 7th May 2019. ‍Otherwise (GST registered 1 or 2 monthly or not GST registered) you make three provisional tax payments - 28th August 2018, 15th January 2019 and 7th May 2019. The same rules apply for individuals and companies but one thing to watch out for is that if both you and your company pay provisional tax make sure you pay each according to the GST status - dates will be different for your company and your personal tax unless both you and your company have the same GST status. There are also options to pay provisional tax on a monthly or 2 monthly basis using the Ratio Method or the Accounting Income Method (AIM) and this may be suitable for businesses that have fluctuating income over the year. There are several criteria you need to meet to be eligible to use these methods and more information can be found here (ratio method) or here (AIM). ‍IRD have an important dates calculator here. Do I need to pay tax in my first year of business? You may have heard that you don't need to pay provisional tax in your first (financial) year of business. This only applies in some cases. If your tax bill for your first financial year will be less than $60,000 then you don't need to pay provisional tax during the year. You still need to pay the tax due at the end of the financial year (i.e. it is deferred tax rather than no tax). If your tax bill will be more than $60,000 you should pay provisional tax as you go based on your expected income for the year. ‍In either case if your tax bill for the year ends up being more than $60,000 and you haven't been paying the provisional tax you will be charged penalties and interest by IRD. increased its value over time there will be a depreciation recovery when you sell it. How much depreciation recovery will I have to pay back? depreciation claimed to date) on the asset sold. No depreciation is claimed in the year of sale. For example if you sell a property at a profit the total depreciation claimed is added back onto your taxable income in the year it is sold. So if you have claimed $10,000 in depreciation over the years then assuming you are on a 33% tax rate the amount of tax will need to pay back as depreciation recovery is $3,300 ($10,000 x 0.33). Can depreciation be claimed in the year of sale? Only on buildings and then only until 31/03/2011 when the depreciation rate for most building becomes 0%. However claiming depreciation on buildings in the year of sale is usually pointless anyway as the depreciation claimed is added back as depreciation recovery. The only exception to this is if the market value of the building has genuinely reduced to the depreciated value or less. What are the tax implications of renting out your own home? You can rent out your own home and you will pay tax on any profit you make. If you want to buy a new home and rent out your existing home then if you only have a small mortgage on your existing home then you can deduct the interest cost of that mortgage from the rent you receive. However to reduce the amount of tax you will have to pay and maximise the interest deductibility you could sell your existing house at its market value to a company registered with IRD as a Look Through Company (LTC) and then borrow the full market price from the bank, repay that to yourself, pay off the existing loan and use the balance to buy your new home. Can I sell my home to an LTC? Yes you can sell your home to an LTC at market value and then rent it out. However if you do this and then live in it and pay rent, IRD does not see this as an arms length transaction and therefore will not let you claim any resulting loss. What tax are you liable for when buying and selling a property? The tax implications depend on your intention when you bought the property. If you bought the property to live in yourself then there are no tax implications from selling (or buying) the property. If you bought the property as a long term rental property then again you do not have to pay any tax on any capital gain when you sell the property. Similarly you can’t claim a loss if the property decreases in value between the date of purchase and sale. However you may have to pay tax on any depreciation recovery if the property has not diminished in value to the depreciated or book value. If you bought the property to make a capital gain, for example, if you decided to do it up and then sell it or rent it out for only a short time before on selling it then you would have to pay tax on the capital gain when you sold it. Regardless of your intentions when you purchase a property, if you sell a property (other than your family home) within 5 years of purchasing it then you would have to pay tax on the capital gain when you sold it. If you are a sole trader and you are using a vehicle that may be used for carrying passengers then you must keep a log book for 3 months to record the percentage of usage that is work related. You can then claim that percentage of the associated vehicle costs e.g. depreciation, petrol, registration, insurance, warrants of fitness, repairs, tyres etc. Your three month log book will last for 3 years but needs to be redone if your usage changes by more than 20%. Therefore you should not do your log book over the Christmas break when your business travel is likely to be low! If you are only doing a small amount of travel you may prefer to keep track of the actual trips completed and the kms travelled and claim these back at IRD rates (73 cents per km for FY 2017 or 81 cents per km for electric vehicles for FY 2017). If you are using a company then it depends who owns the vehicle. If you personally own the vehicle you can be reimbursed for the actual costs based on a logbook of private vs business use or you can be reimbursed for the business km's travelled using IRD mileage rates. If the company owns the vehicle you can claim 100% of vehicle costs and have unlimited private use if you pay FBT on the value of the fringe benefits provided from the vehicle use. If the vehicle is not available for private use (100% used for work) then there is no FBT but this is hard to prove and usually only applies to vehicles that are obviously only used for work such as vans and trucks. From the 2017-18 income year onwards some close companies (i.e. 5 or fewer shareholders) can elect to opt out of FBT rules. To qualify you must have only 1 or 2 motor vehicles available for private use by your shareholder-employees and provide no further benefits. Instead you'd need to make a private use adjustment in the company's tax return. This only applies to vehicles acquired or first used for business use from the 2017-18 income year. FBT (or fringe benefit tax) is tax paid by a company or employer on non-cash benefits paid to employees. This includes shareholder employees. The usual fringe benefits are cars, low interest loans and the personal use of business assets. It is payable quarterly or annually for some employers. How do I register a company for FBT? When you first start giving employees fringe benefits, you need to register for FBT. You can register by calling Inland Revenue. The Inland Revenue will ask whether you are providing fringe benefits to shareholder employees or ordinary employees as well as whether you want to file quarterly returns, income year returns or annual returns. Income year returns are only available if fringe benefits are being provided to shareholder employees only. Income year returns are also useful if you have a non standard (ie non 31 March) balance date. If you are providing fringe benefits to ordinary employees you need to elect to file quarterly or annually. However there are some complicated due dates for registering for FBT for income year or annual filing. As a basic guide you need to register by the last day of the first quarter in the income year, so if your balance date is 31 March 2019 you need to have registered by 30 June 2018. If you register after this date you will be required to file quarterly returns but may be able to switch to income year or annual filing the following year. We tried to answer this question with a simple calculation but it ran to many pages so rather than burden you with that perhaps a rule of thumb will do. You can find the IRD online FBT calculator here. Are there any benefits of buying a company car? Can I buy a company vehicle without paying FBT? Yes if you can prove to IRD that it is not available for private use. This is easier to prove if your vehicle is clearly a work vehicle that would not be used privately - e.g. a van or truck or a vehicle that has had the back seats removed and with work signage. In other cases its harder to prove - you should write a letter to the shareholder employee (yourself) advising them the vehicle isn't available for private use, the shareholder employee needs to agree to this in writing, have another vehicle available for private use and keep a logbook of the company's vehicles actual use to show it is only used for business. Note: Under NZ’s self assessment tax system you can claim what you like but if IRD looks at it and isn’t happy then you may be charged penalties. From the 2017-2018 income year onwards some close companies (i.e. 5 or fewer shareholders) can elect to opt out of the FBT rules. To qualify you must have only 1 or 2 motor vehicles available for private use by your shareholder-employees and provide no further benefits. Instead you'd need to make a private use adjustment in the company's tax return. This only applies to vehicles acquired or first used for business use from the 2017-18 income year. Are there exemptions from FBT? Yes you can pay employees (including shareholder employees) benefits of up to $300 per quarter (inc GST) without needing to file an FBT return and pay FBT on the benefit. For example your company could pay for your gym membership or pilates classes. However if the value of the benefits for an employee goes over $300 for a quarter, the full value of the benefits is subject to FBT— the exemption isn’t deducted first. Yes, all taxpayers can claim a deduction for use of money interest paid to the IRD in the year it is paid. Should I sign up for Kiwisaver? Kiwi Saver works well if you are an employee and your employer is contributing. If you are self employed or a shareholder employee there is less benefit and you may be better off paying off mortgages or investing in your business. For GST at 15% the fraction is 3/23 – e.g. to calculate the GST portion at 15% of a $99 purchase multiply by 3 then divide by 23: $99*3/23 = $12.91. To check you have it right multiply the GST exclusive amount you have calculated by 1.15 - you should end up the the original GST inclusive amount. How do I register for a myIR username at IRD? the usual things like date of birth and address to confirm you are who you say you are. What are the best payroll systems for small businesses? The short answer is that a managed payroll system such as Smart Payroll, iPayroll or Thankyou Payroll is probably your best and best value. These providers will take care of all the payments to your employees, filing employer schedules with the IRD and paying the PAYE to the IRD on your behalf. Xero Payroll and Flexitime are also options but they are not as automatic as the above and you may still be required to do a lot of the administration yourself. If you have earned or will earn more than $60,000 in a 12 month period then you need to register for GST. The exception to this is if you are only exceeding this threshold because you are selling capital items to replace existing assets, or selling capital items because you are winding down or ceasing business activity. More information on the IRD website here. Have a look at the next couple of FAQs too. Should I register for GST even if I don't have to? If you earn less than $60,000 you can still register for GST if you want to. In some cases it may be beneficial to register for GST as this allows you to claim back the GST on your inputs (expenses). If you mainly sell your products/services to people/organisations that are GST registered then they can claim back any GST they pay you, so it makes no difference to them if you charge them $x no GST (not registered) or $x plus GST (registered). However if you are selling products or services to the general public who can't claim the GST back then it is usually best not to register for GST. If you do register you either have to add GST to your current prices (so it costs them more) or you keep your current prices so you receive less after you have paid over the GST component to IRD. What GST basis and period should I register for? When you register for GST you get some choices - first up you need to decide if you want to be on a Payments, Invoice or Hybrid basis and then you need to decide if you want to file monthly, two monthly or six monthly GST returns. Payments basis means you only include GST in your GST return when you receive the money/spend the money. Invoice basis means you include the GST in your returns when you issue an invoice - you may end up paying GST to IRD before the customer pays you! Hybrid basis means you claim GST when you spend the money (like payments basis) but pay the GST to IRD when you issue an invoice (like invoice basis) - the worst of both worlds. The choices you have depend on your turnover (revenue/what you sell/taxable supplies). Regardless of what you choose or have to choose you will need an accounting system that makes it easy to calculate your GST returns - we suggest Xero. It really does take the admin overhead out of GST, it almost makes it fun. If your turnover is under two million you can choose between payments, invoice or hybrid basis. If your turnover over two million you must choose either invoice or hybrid basis. There is a an exception, if your taxable supplies are over $2 million but the payments basis would suit you because of the nature, value, and volume of your taxable supplies and your type of accounting system (typically businesses which make most sales for cash) - if you meet this condition and want to use this option you need to apply to IRD in writing. If your turnover is less than $500,000 you can file six monthly, two monthly or monthly returns. If your turnover is between $500,000 and 24 million you can file on two monthly or monthly returns. If your turnover is more than $24 million you must file monthly returns. So given these rules what is best for you? - You don't have to pay over GST until you have been paid yourself. your floating mortgage) and minimise admin, only two returns a year. monthly is a good compromise. book work and not be tempted to spend GST money on something else. 1. Increase your screen real estate by maximising your browser and switching off the green getting started guides. 2. 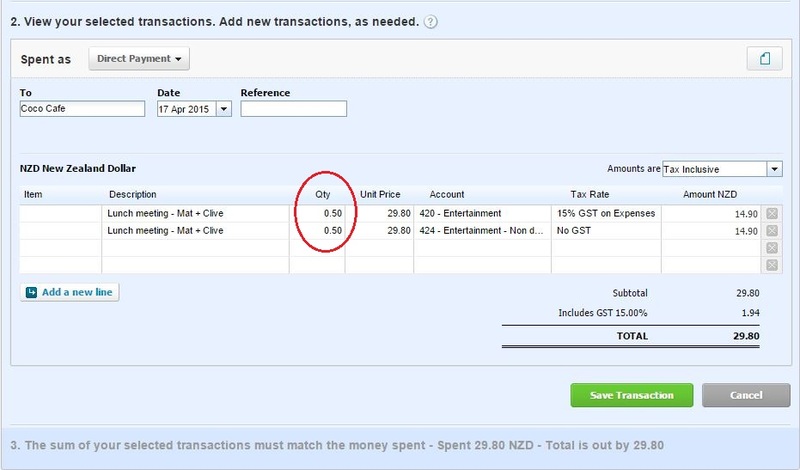 Use lots of tabs - for example in the GST audit report if you want to recode a few transactions you can right click and open each in a new tab. When you have finished recoding delete those tabs and just refresh the browser on the GST audit report. 3. When reconciling, rather than selecting the account code from the dropdown list just start typing the name or number - Xero will find it faster than you can select it from the list. 4. When entering dates in date fields, tab to get today's date. If you want a different date just type it in, any date format will do, Xero will work it out. It is faster than using the drop down calendar. 5. 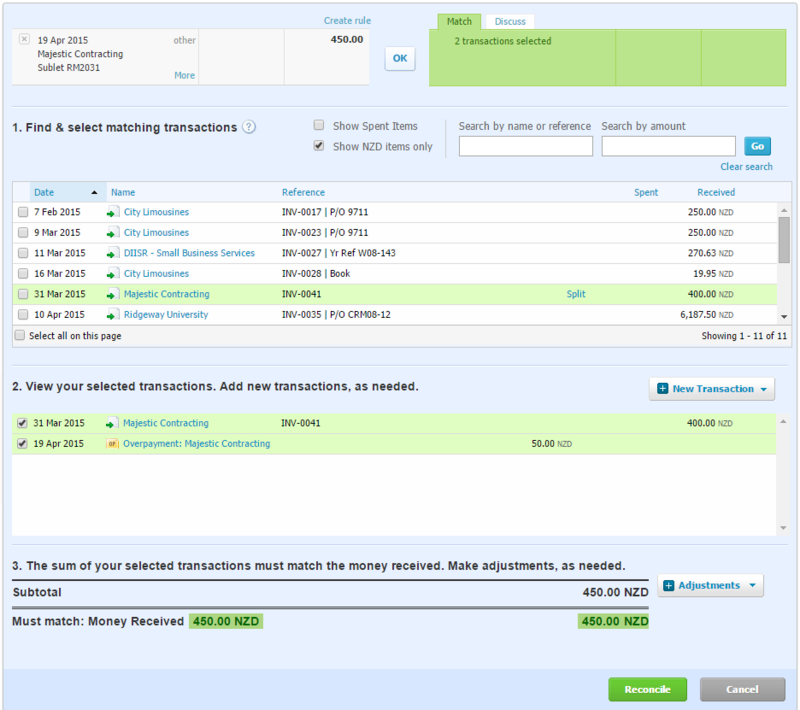 A lot of the Xero screens have the option to select the number of items to be displayed on a page. Rather than scrolling through pages, increase the items to be displayed to the maximum eg from the standard 25 items per page to 200. 6. When you change to a different Xero organisation in one browser tab or window, any other Xero tabs/windows will be switched to that organisation the next time you do anything. You can log on to two organisations at the same time by either using two different browsers (e.g. Chrome and IE at the same time) or the same browser twice if one is in an Incognito window. 1. If you need to recode a transaction either edit it or use the Remove and Redo button and reconcile it again. 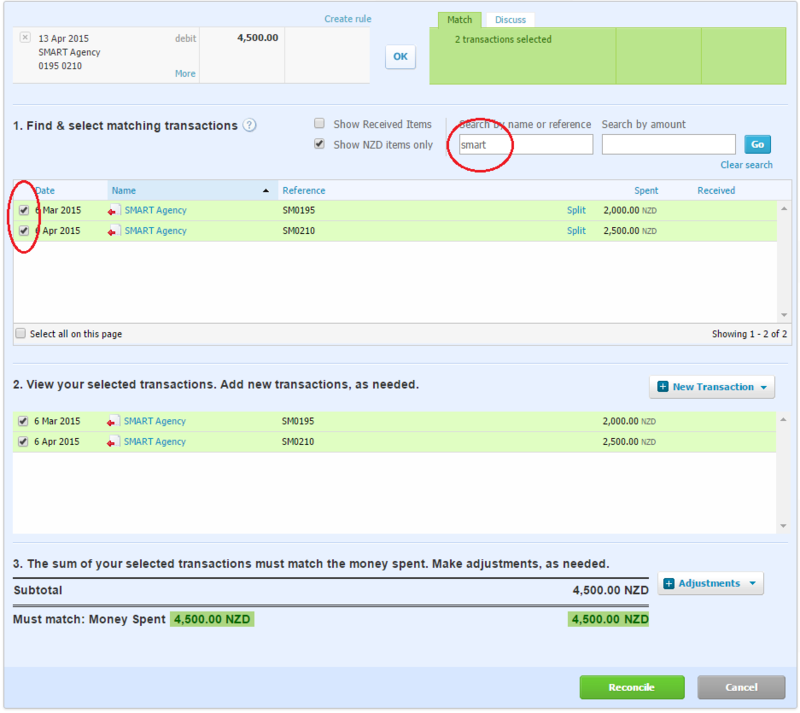 If you need to change multiple transactions have a look at Find and Recode on the Advisor menu. 2. Entertainment - you can split it as you go between deductible and non-deductible entertainment codes using Add Details on the reconciliation screen. However this can be a bit time consuming so if you want just code it all to Entertainment and we will make half non-deductible when we do the year end accounts. Also see our Entertainment FAQs. 3. Property managers statements - you can split these as you go to account for the expenses deducted by your property manager. This can also be quite time consuming so if you want just code all the income to rental income and we will gross up the rent and account for the deducted expenses when we do the year end accounts (we will need copies of your property managers statements to do this). 4. Xero will only let you change the account code of a paid invoice. If you need to change anything else delete the payment from the invoice by going into the invoice, drilling down on the payment and clicking the Options button and clicking Remove and Redo. Then edit the invoice to make your changes and when you are finished reconcile the payment to the invoice again. You can also use Find and Recode. How do I convert from my old accounting system to Xero and what's the cost? The easiest way to migrate to Xero is to do the conversion as at the end of the financial year. Assuming your financial year ends on 31 March we would take the closing balances from your old accounting system (e.g. MYOB) as at that date and enter them into Xero as conversion balances. 1. 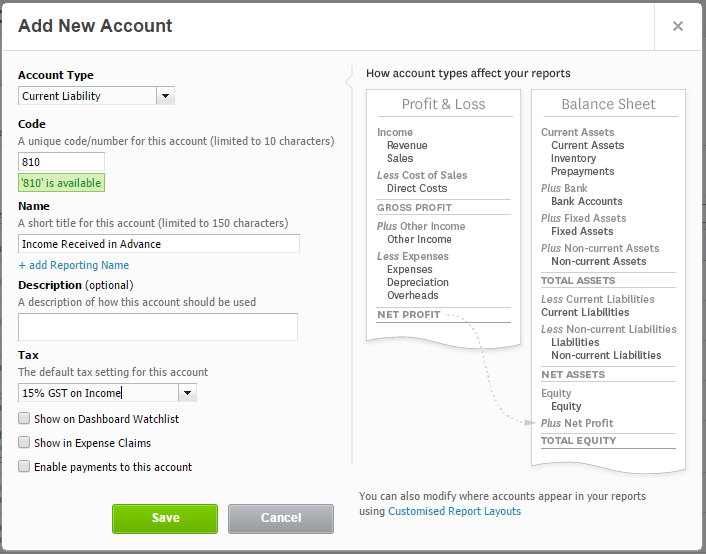 Set up the Xero account with an appropriate chart of accounts. If you currently use MYOB we can import the MYOB chart but often it makes sense to use the Xero chart of account and just add a few you may need. 2. Set up bank accounts in Xero with bank feeds and import historical bank data from 1 April. 3. Set up credit cards in Xero and import historical data from 1 April. 4. 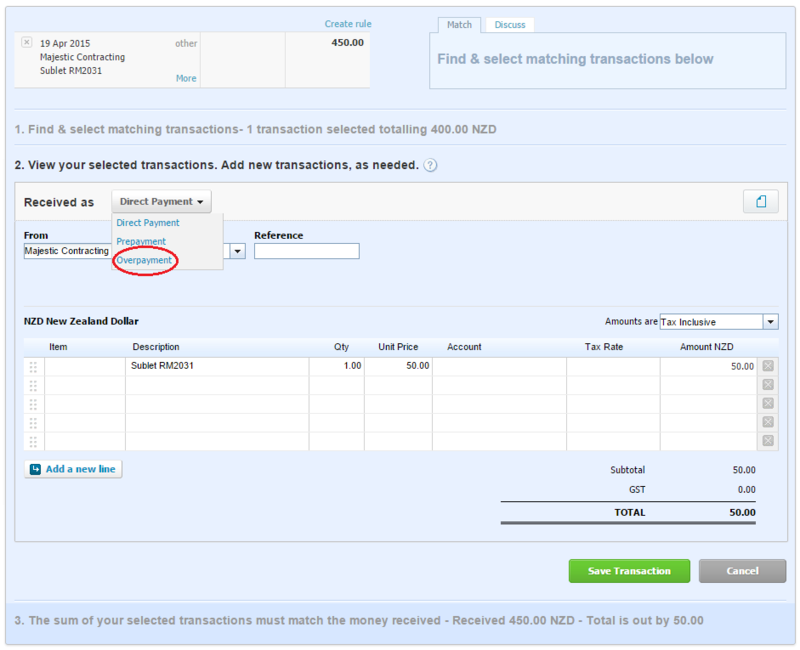 Set up invoicing in Xero. 5. Enter sales and purchases (receivables and payables) invoices outstanding as at 31 March. 6. Enter conversion balances from your old system. 7. Enter fixed assets from your old system. At this stage you would then reconcile all the transactions since the start of the financial year, this might take and hour or so depending on how many transactions there have been. The advantage of doing it this way is that you get a full years data in Xero for financial year and we are using your published financial statements as a starting point. Alternatively we take 1 October as the Xero start date and use your 30 September balances from your old system. Either way the cost/effort involved in doing this very much depends on the state of your old system. If we can take your profit and loss, balance sheet and receivables and payables and use these as they are then the conversion will take approximately two hours, with another two hours for one on one training. We charge this work at $150 plus GST per hour so the total cost would be $600 plus GST. What is the Xero Cashbook version? 1. You can’t create invoices for sales and purchases (accounts receivable or accounts payable). 2. There is an “Ask my Adviser” option on the help menu – in the full Xero versions this sends questions to us via email. 3. There are fewer reports available to your accountant. How do I code money I put into or take out of the business? If you transfer money into the organisation (e.g. to help pay for mortgage interest for a rental property) code to 970 Funds Introduced. If you are paying yourself a salary and paying PAYE to IRD code to 477 Salaries. The PAYE component can be coded to 477 Salaries or 477/PAYE IRD PAYE Tax (your personal preference). Otherwise code all money you take out of the organisation as 980 Drawings and at the end of the financial year your accountant will sort it out. Also have a look at "What do I code tax payments and refunds to FAQ"
How do I manage my business credit card? The easiest way by far is to set it up as a bank account with an automatic bank feed and then reconcile the transactions as you do for an ordinary bank account. Most New Zealand credit cards now have bank feeds. 1. Set the import start date as the day after the last transaction imported. 2. Set the end date at least two business days before the day you do the import (some banks like to change the transaction dates a day after the transaction has turned up in internet banking). 3. Import once a month or so - don't leave it too long as some banks only hold three months of transactions online. 4. When importing if you get prompted to enter a date format select DD/MM. Remember if you have the card setup as a bank account when the payment goes out of your transaction account to pay the bill code this as a Transfer not a payment (see transfers below). If you don’t set the card up in Xero then when you pay for the credit card bill from one of your business bank accounts the payment will come up as a transaction to be reconciled. When you reconcile the payment in Xero use the Add Details link on the Create tab to add line items for each of the purchases the payment is paying off, coding each to the correct account code. This will only work if you always pay off the full amount rather than the minimum payment and it is time consuming if you have lots of credit card transactions. There is a good explanation of how to manage credit cards at the Xero help centre here. How do I manage my personal credit card when I use it for business? If you use it mostly for business then set it up as a business credit card as above and code any personal transactions to Drawings. If you find you have a lot of personal transactions then you can still use it in Xero. You may want to set up a bank rule that codes everything on that credit card account to drawings by default and then when it isn't drawings just click the don't apply rule link on the reconcile screen. Or if you use it mainly for personal use and occasionally make a business purchase then it may be easier to keep it out of Xero and claim the expenses back as detailed in the next FAQ. How do I reimburse myself for business expenses I've paid for? For individuals and small businesses we recommend keeping a breakdown of expenses in a spreadsheet and periodically making a payment from the business account to yourself for the amount of the expenses. When you reconcile the payment in Xero create a transaction and use Add Details to add a line for each of your expenses selecting the appropriate expense code. If you have a version of Xero with invoicing (i.e you have the option to Add a Sales invoice or Bill on the dashboard) then a fast and easy way to reimburse yourself is to use an Accounts Payable Invoice (now called a Bill) in Xero. When the bill is complete, Approve it and then either transfer the money to pay you the total of the invoice or pay it out of funds introduced. Coding it to Fund Introduced adds it to the amount the business owes you and it will be offset against drawings at year end. 1. Create - On the Accounts tab under expense claims add receipt(s) to create an expense claim. 2. Submit for Approval - When you have finished adding receipts and want to pay the claim tick them all and click Submit for Approval (in Accounts/Expense Claims/Current Claim). 3. Approve and Authorise - In Accounts/Expense Claims/Awaiting Authorisation click into the claim then click the Approve button. Enter the payment date and reporting date and click Authorise (use the same date for everything - this is the date it will go into the accounts and GST return). 4. Pay the Claim - It is easiest to pay from Funds Introduced. In Accounts/Expense Claims/Awaiting Payment click into the claim, enter the amount paid as the total of the claim, enter date paid same as the date in 3 above, in paid from select Funds Introduced and click the Paid button. Regardless of which way you do it make sure you put plenty of detail in the description field so you don’t have to go hunting later to find out what the payment was for. Have a look at the next FAQ item for more details on Bills (Accounts Payable invoices) and Expense Claims. How do I enter home office costs into Xero? First off you need to know what home office costs you can claim and the the percentage of your home you will be claiming for (see "What home office costs can I claim?" in General FAQs). If you have a version of Xero with invoicing (i.e you have the option to Add a Sales invoice or Bill on the dashboard) then a fast and easy way to enter you home office costs into Xero is to use an Accounts Payable Invoice (now called a bill in Xero). If you don't have invoicing you can use an Expense claim - it is a bit more convoluted but it gets there. Alternatively you can just give us the information at the end of the year and we will add it into the final accounts for you! Create a new bill dated the last day of the financial year (e.g. 31 March) and add a line for each cost you are claiming. 1. Set the reference to Home Office and the amounts to be Tax Inclusive (if you are GST registered). 2. Enter the percentage you are claiming in the quantity field (e.g enter 10% as 0.10) and the full amount of the expense in the unit price field. 3. Code all home office costs to Office Expenses. 4. If you are entering interest on your mortgage make sure that you set the tax rate to No GST for that line. When the bill is complete Approve it and then pay it from Funds Introduced with the Payment date set to the same date as the bill. If you need to change the bill after you have paid it just click into the paid bill, click into the payment and delete the payment. Then you can edit the invoice and add the payment again. Create a new expense claim as detailed in the FAQ above and enter the home office costs. 1. Set the line amounts to be tax inclusive. 2. Add a line for each cost you are claiming, enter the percentage you are claiming in the quantity field (e.g enter 10% as 0.10) and the full amount of the expense in the unit price field. Once you have your claim completed then you can submit it, approve it and pay it from Funds Introduced. Important: When you approve the claim you are asked to enter the payment and reporting dates and authorise it - use the date you want it recorded in the accounts (usually the last day of a GST period or the last day of the financial year). Once the claim has been Authorised you can only change it using the Advisor/Find and Recode feature. How do I code expenses I charge a client for? From a tax and GST point of view it doesn't matter as long as the GST is correct and is treated the same way when you code the expense and also the corresponding payment from the client. However if you have a lot of these expenses it is best to separate them out so a) you can find them easily and b) they don't get included in your normal business expenses and overheads. To do this create a Reimbursible Expense expense code and code all the expenses you are going to invoice client for to this code when they are incurred. When you invoice the client also code the income to this expense code. The balance of this account then always shows what you haven't yet invoiced clients for. How do I code transactions to individual rental properties? In other accounting systems you would usually set up separate ledger codes for each rental property then code the transactions to these. This gets unwieldy as you end up with a lot of account codes that are effectively the same thing. Xero has a better way of doing it called "Tracking". You set up a tracking category (e.g. Rental Properties) and then add each rental property as an item (e.g. 53 Marine Parade, 17 Hill St) and whenever you reconcile a transaction you can select the category and property that the transaction relates to from a drop down list. The Xero reports have options that allow you to report by tracking category. There is more detail on this at the Xero help centre here. What do I code equipment purchases to? Equipment costing $500 or greater (excluding GST) is treated as a fixed asset and should be coded to an asset account (e.g. 'Office Equipment'). At the end of the financial year we will calculate the depreciation for the assets and code it to the assets depreciation account. How do I code entertainment expenses? Usually entertainment expenses (meals and drinks consumed off the office premises) are 50% deductible so you code half of the payment to “ Entertainment” and half to “Entertainment – Non deductible”. 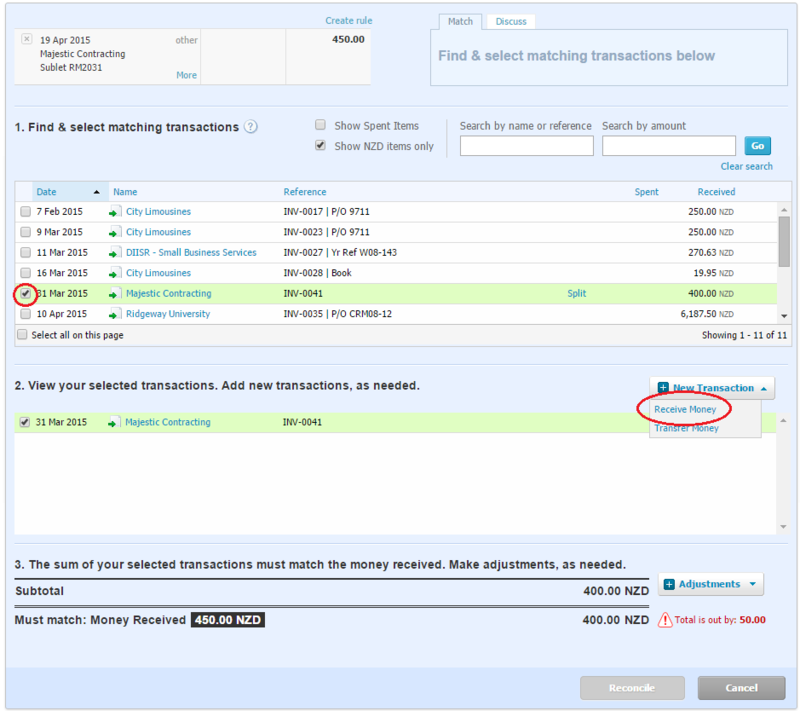 You can do this in Bank Reconciliation by clicking the Add Details link on a transaction and adding a second line. If you put 0.50 in the quantity field Xero will do the maths for you. Alternatively as this can be a bit time consuming you can code it all to Entertainment and we will make half non-deductible when we do the year end accounts. If you bring food or drinks into your office (e.g because people are working late) then it is usually fully deductible - code to 'Office Expenses'. If you are travelling for work any of your accommodation and associated costs (meals etc;) are fully deductible - code to one of the travel expenses codes. However if while travelling you are paying for meals for work related guests then the cost of the meal is only 50% deductible - code 50% to travel and 50% to Entertainment - Non deductible. How do I code refunds I receive? Refunds you receive will appear as receipts in the bank reconciliation. Code them to the same account you coded the original payment to. Can I claim GST on overseas purchases and imports? If you are travelling overseas then there will not be any GST to claim on your overseas purchases and travel. When you reconcile the payment make sure you click Add Details and select No GST or create a ledger code specifically for the overseas expenses that defaults to No GST. Don't be fooled by the Australian GST - its not the real thing and you can't claim it in New Zealand, it is just a part of the purchase price. 1. Those costs without any GST – e.g. overseas freight, insurance and admin fees, duty. Code to the appropriate code in Xero with Tax Rate No GST. 2. Those costs that do have GST on them – e.g. NZ freight, insurance and admin fees. 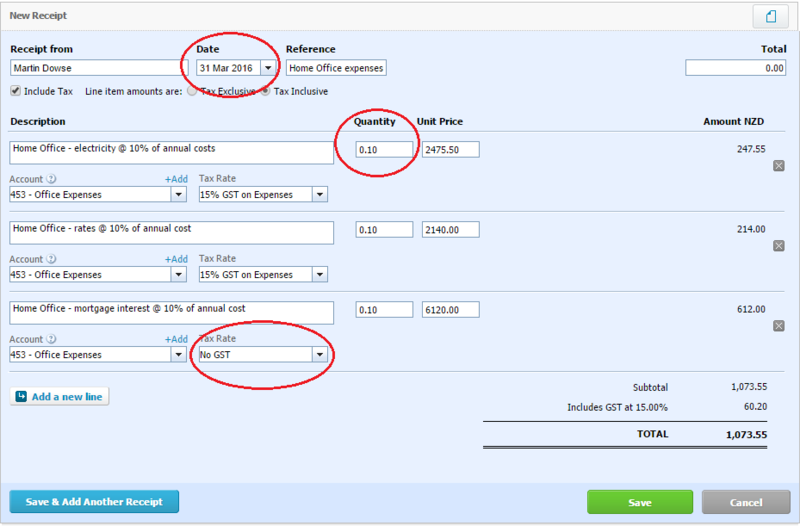 Code to the appropriate code in Xero with Tax Rate 15% GST on Expenses. 3. The GST on imports that customs charge you. Code to 820 GST with Tax Rate GST on Imports. This makes sure it shows up in the Xero GST return as GST you have paid. What do I code tax payments and refunds to? 1. Don’t code anything to 505 Income Tax Expense at Year End – it’s for us to use when finalising the tax position at year end. 2. If you type IRD in the account code box on the reconciliation screen it will bring up all the relevant codes for all taxes except GST. 3. If in doubt code to 830 IRD Income and Provisional Tax. What do I code GST payments and refunds to? Code all GST payment to IRD / refunds from IRD to 820 GST. How do I file a GST return with Xero? You can file your GST return directly with the IRD from within Xero. To do this you need to have a myIR login with IRD (if you haven't got one yet see the General FAQ titled "How do I register for a myIR username at IRD?"). First of all make sure you have reconciled all your transactions in Xero to at least the end of the GST period, run the Xero GST report and checked the Xero GST audit report. Once you have finalised your GST return in Xero you get a "File now with IRD" button at the top of the return. When you press the "File now with IRD" button you will be prompted to enter your myIR username and password and then the GST return will be filed and you will be returned to Xero. You know the return has been filed correctly as instead of the File now button you will see a successfully filed message. Now all you need to do is pay the GST to IRD or if its a refund watch it come into your bank account. If you are also paying provisional tax we recommend you do separate bank payments for each as it makes your reconciling easier. Remember when you reconcile the payments or refunds in Xero code GST to "820 - GST" and Tax to "830 - IRD Income and Provisional Tax". Change the Tax form. There are only two options GST 101 and GST 103 so change it from whatever you have to the other one, save the settings and then try filing the GST return again. If it still doesn't work log a call with Xero or contact us. 1. Select "I know the GST components and need to work out the total sales and purchases". 2. Select No for the "Is this the last GST return for this GST number?" question. 3. Complete the Sales and income and Purchases and expenses sections using the numbers from the Xero GST return. 5. Check the totals match the Xero GST return. 6. Review the return and submit it. What do I code provisional tax payments to? These get coded to 830 IRD Income and Provisional Tax. At the end of the year your accountant will calculate total amount of tax expense for the year and use 505 Income Tax Expense at Year End to record that. What do I code PAYE tax payments to? Code to 477/PAYE IRD PAYE Tax. If this code is missing use 477 Salaries. How do I change the account code on a reconciled transaction? Then go back into the reconciliation screen – the transaction should appear there and you can reconcile it with the correct code. If you have a lot of transactions that need to be changed have a look at Find and Recode on the Advisor menu. If you want to see all transactions coded to a particular code then Settings/Chart of Accounts, find the account code and click on the number to drill down and see all transactions coded to that code (oldest to newest). Alternatively you can use Reports/All Reports/Account Transactions, select the account code and date range and click Update. Note these are all GST exclusive amounts. How do I handle transfers been bank accounts? 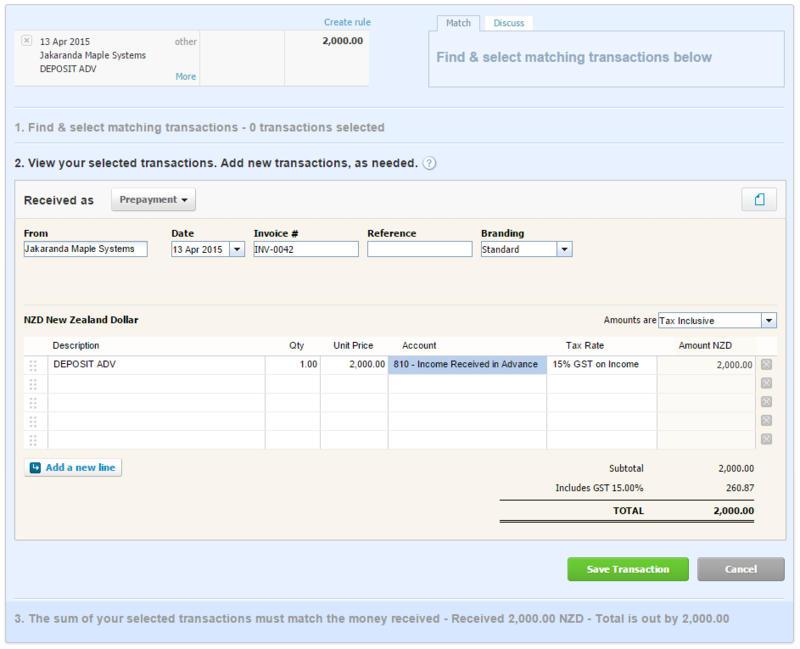 In Xero you can code transfers between bank accounts directly in the reconciliation screen. On the right hand side of the reconciliation screen there are Match, Create, Transfer and Comments tabs. 1. 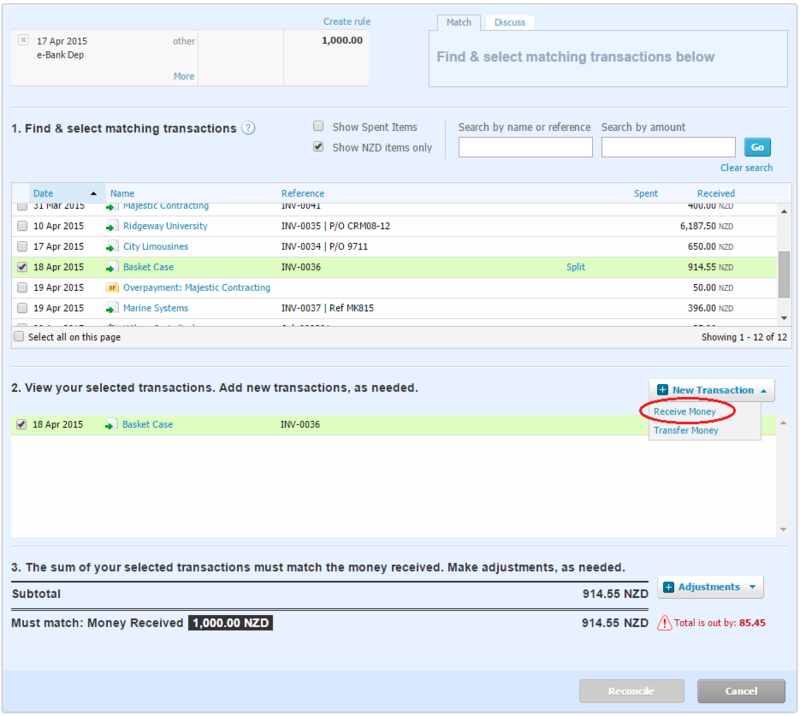 Source account: When reconciling a transfer select the Transfer tab and then select the bank account the transfer is going to. Click Ok.
2. 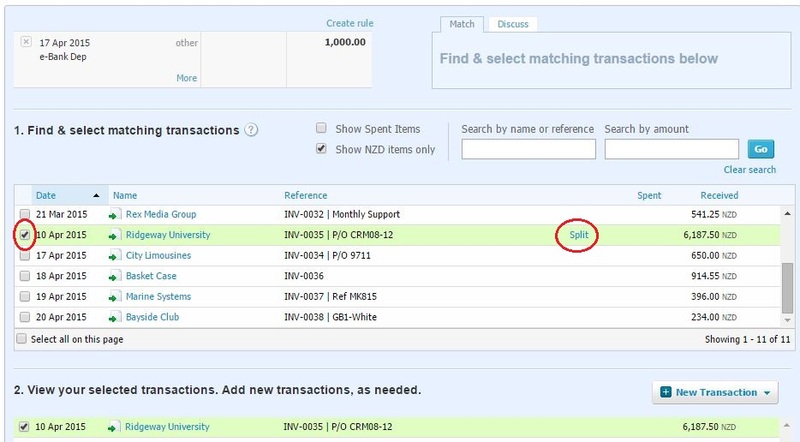 Destination account: When you reconcile the transfer transaction Xero should match it up with the transfer you created in the source account and show it on the Match tab. Click OK to reconcile. How do I use credit notes in Xero? There is a really good explanation of credit notes on the Xero Help site here. How do I reconcile a partial payment on an invoice? 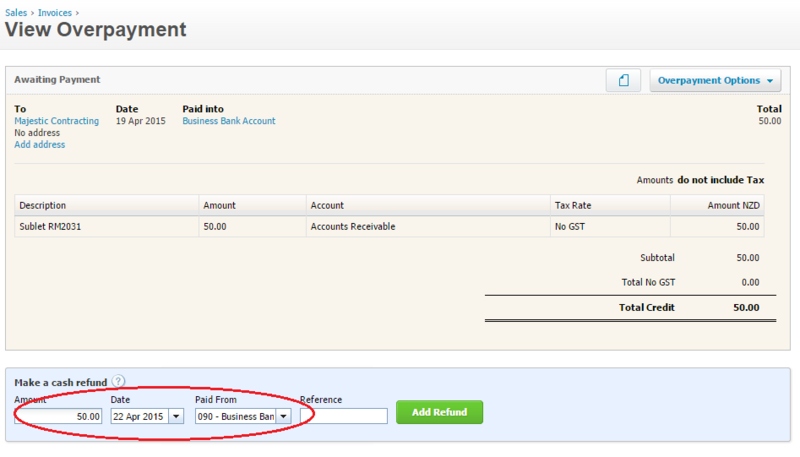 You can apply a part payment to an invoice from within the bank reconciliation screen. In the reconciliation screen click the Find and Match link. On the Find and Match screen tick the invoice or expense claim that you want to apply the partial payment to. Then click the blue "Split" link on the line you just ticked and enter the amount. Click Split then Reconcile to save it. How do I reconcile a payment for multiple invoices? 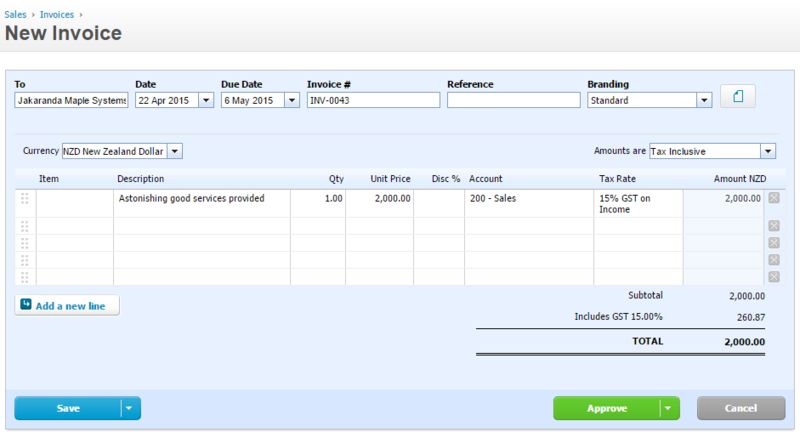 You can apply a payment to more than one invoice from within the bank reconciliation screen. In the reconciliation screen click the Find and Match link. 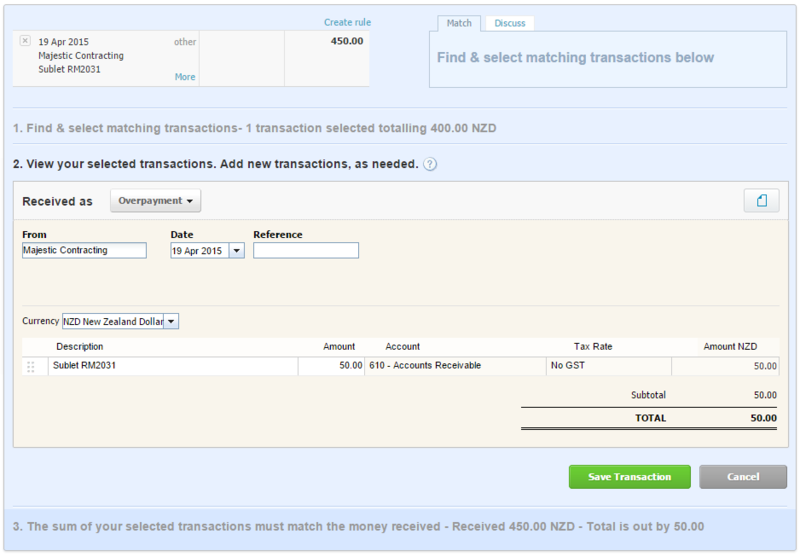 On the Find and Match screen tick the invoices that you want to apply the partial payment to then click Reconcile. 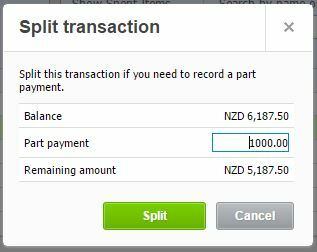 If the total of the payment is less than the total of the invoices then use the Split option described in the previous FAQ. How do I code an overpayment from a customer? The end result is that the payment is reconciled and there is a special type of credit note created in Account Receivable/Awaiting Payment for the overpayment. 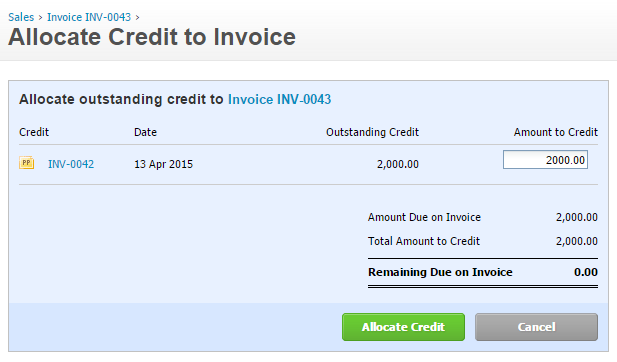 The next time you invoice the customer Xero will ask you if you want to apply the credit. If you want to refund the overpayment to the customer then go into the credit note and at the bottom fill in the Make a cash refund section, entering the amount being refunded (usually the full amount of the overpayment), the date you are refunding them and the bank account the refund will be paid from and click Add Refund. Then when the refund has been paid and you go to reconcile the transaction it will match the overpayment credit note. The screen shots below show the process in more detail. On the $450 payment on the reconcile screen click Find and Match, tick the invoice the payment is for - this leaves the total out by $50, click the Create new transaction +New button and select the Receive Money option. On the Receive Money transaction click the Direct Payment button and select Overpayment. Change the From to be the contact name (if not already set correctly). Check the amount is the correct amount of the overpayment and click Save Transaction. Now on the Find and Match screen two items will be selected, the $400 invoice and the $50 overpayment adding up to the $450 paid - click the Reconcile button. If you want to refund the overpayment to the customer then go into the credit note and at the bottom fill in the Make a cash refund section, entering the amount being refunded (usually the full amount of the overpayment), the date you are refunding them and the bank account the refund will be paid from and click Add Refund. How do I code a prepayment from a customer? Before you start you will need to set up a chart of accounts code for the prepayments. It needs to be of type Current Liability and if you are GST registered should have a tax rate of GST on Income. Call it something like Income Received in Advance as the term prepayment is confusing - it is also used for expenses you pay in advanced (prepaid expenses). From here on the process is similar to reconciling an overpayment (see the preceding FAQ). Start the same way by using Find and Match, clicking the New / Receive Money button and then change the Received as from type Direct Payment to type Prepayment. Fill in description and in the Account field select the Income in Advance account you created and click Save Transaction then Reconcile. The prepayment then sits in the system a bit like an accounts receivable credit note. You have the option of refunding it by adding a refund to the prepayment "credit note" (same as overpayment) or creating an invoice and allocating the prepayment to it. Note: Income in Advance shows on the balance sheet report as a liability (GST exclusive). How do I code small differences between what was invoiced and what was paid? You can adjust for small differences (cents rather than dollars) between what was invoiced and what was paid using the adjustment option in the reconciliation screen. For larger differences you can do a find and match to match the invoice and then click the receive money button on the find and match screen to create a receive money transaction for the remaining amount. If it is an overpayment then have a look at the Overpayments FAQ item. How do I change my email address in Xero? Do I need Xero training? Xero isn't hard to use but it is different to traditional desktop accounting systems. If you use it the "Xero way" it is blindingly efficient, if you use it as you would other accounting systems then you end up creating extra work for yourself. If you enjoy reading manuals and watching how-to videos then you can absolutely teach yourself how to use Xero effectively in a few hours or less. However if you are like most of us and you just want to start using it we recommend strongly that you get some one on one Xero training to point you in the right direction. It will save you a lot of time down the track. We can provide this training. Where has the manage button gone? Xero is constantly being improved and early in November 2016 the Dashboard got a makeover - it is now prettier and faster. As part of this the Manage button is gone, replace by three little dots.